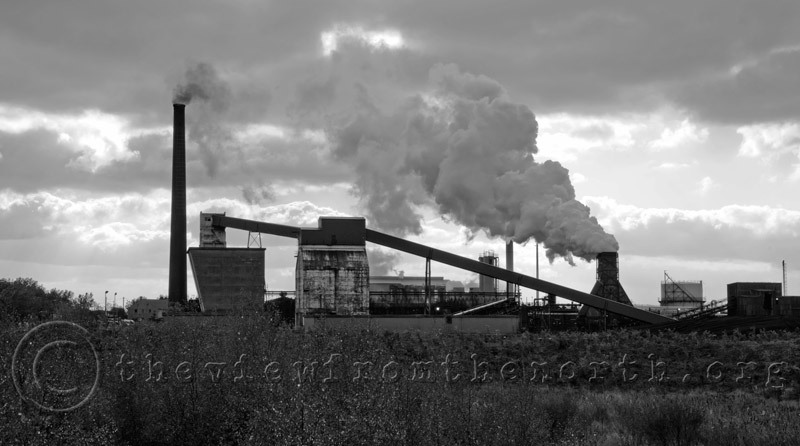 Inside, the site was dusty and grubby, and outside on the pavement where I stood, my boots made imprints in a thick layer of slightly sodden black coal dust, doubtless washed up off the road from the tyres of the coal wagons going to and from the site. 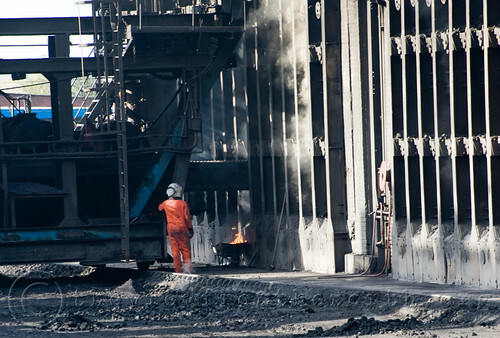 Suddenly, three men in grubby orange boiler suits and silver flame retardant headgear appeared and approached the long grimy bank of coke ovens. A siren sounded and atop the ovens, a mobile hopper slowly whined along the top to fill one of the tall steaming ovens with coal. Working independently of the hopper, a large grimy contraption ran on rails parallel to the ovens, driven by another orange clad worker. The three approached him and a discussion ensued. A wheel barrow was produced, and the contraption started extending itself into the ovens. Suddenly, great clouds of steam started billowing from a triangular wooden cooling tower, and an orange clad worker started prodding the oven, like a kamikaze volcanologist, reaching inside an industrial Vesuvius. Flames and molten matter poured into the hapless wheelbarrow. Around the other side of the ovens, steam and dust erupted form the oven and filled a railway truck as the steam continued to billow from the Toblerone like cooling tower. I wandered further down the road, over the slightly elevated road bridge that once took the road over an old colliery railway. To the east I saw the old trackbed leading to a series of manmade hills, doubtless the legacy of the coal industry that once dominated this landscape, both physically and socially. Over the bridge, I turned down an old road, past a coal merchants that was massively well protected with a cluster of CCTV cameras, and scrambled up a newish, sapling topped embankment. Looking back at the Coke works, I was struck by the geometry of the ugliness – tall chimneys, long diagonal conveyors, huge hoppers and towers. It is a landscape designed by a draughtsman, a big industrial dragon, belching smoke and flames. To my right stood huge black mountains of what looked like black sand, but was more likely finely graded coal. These were great stockpiles of coal, the raw material that feeds the plant, and what provided a living for generations of local men until the 80’s, when Maggie’s determination to crush the unions led to the demise of a once great industry. 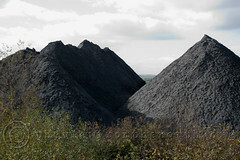 It was stockpiles of coal like this that helped bring the strike to an end, as the power stations kept generating and the lights stayed on, unlike the 70’s. And then a distant siren brought me back to the present, and a plume of white steam erupted form the cooling tower. This is the way of industry – regular, continuous, dirty and monotonous,, but providing works and comradeship for those brought together to undertake it. For better or for worse, one day this industrial dinosaur will be as extinct as the coal mines that once surrounded it, and maybe then, that odour of industry will be freshened at last.